New York, Lagos, Tokyo, Paris, Mexico City, Guangzhou, St Petersburg, Mumbai. What do these cities have in common? What prompts major centres of population, trade, and political power to develop in some locations and not others? In his ‘How to build a city from scratch: the handy step-by-step DIY guide’ published in The Guardian, Stuart Jeffries mentions that, when it comes to finding a spot for your new city, “uninhabited islands are popular.” Jeffries has his tongue in cheek, yet the advice is more sound than he imagines, for the common attribute of all of the above cities and many more across the globe is that they had their decisive starts on small islands or archipelagos. Indeed, small islands and big cities coincide so frequently as to make it impossible to understand cities without also understanding island cities. In an attempt to comprehend today’s global networks of urban processes, urban theorists have increasingly turned to abstract spatialised understandings of the city, at the risk of overlooking place-specific factors of urbanisation. One result has been that the link between islands and cities has gone largely unnoticed. It is time to redress the imbalance by investigating why major cities are so likely to form on small islands. A new article in Area – ‘Island City Formation and Urban Island Studies’ (Grydehøj 2015) – argues that aspects of island spatiality encourage city formation. The article advances the theory that territoriality benefits help political and economic elites maintain local authority and project power outward, defence benefits help protect local powerholders from external military threat, and transport benefits make strategically located small islands ideal sites for port industries. Once urbanisation is underway on a small island, other aspects of island spatiality come into play: Lack of land due to the city’s water borders favours dense urban development, which in turn brings competitive advantages for local businesses. 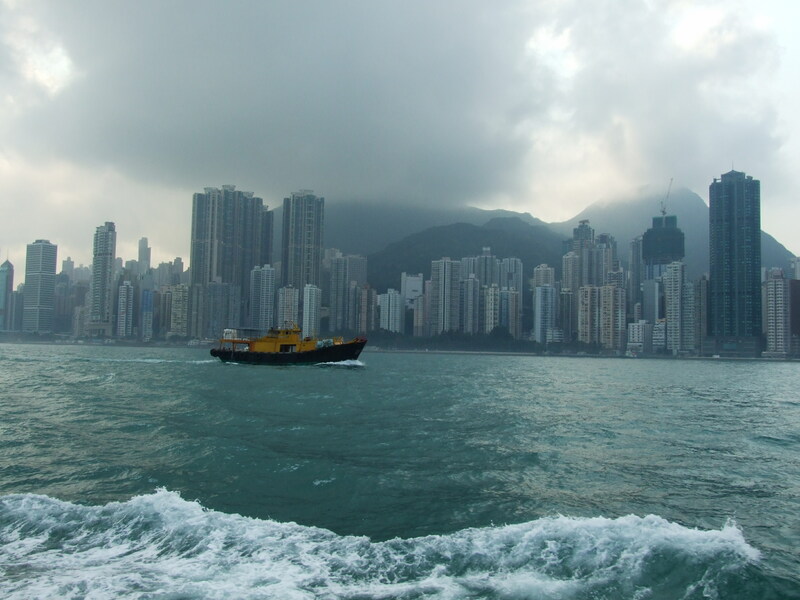 ‘Hong Kong Island’, Source: Adam Grydehøj. Whatever the reasons, island factors seem to have a powerful impact on urban processes: Six of the world’s ten most populous cities; eight of the world’s ten busiest ports; the largest cities in the sub-Saharan Africa, South America, and the USA; and the capital cities of five European states have developed on or from small islands. However, the processes behind such island city development are diverse and are grounded in specific historical, political, and socioeconomic contexts (Pigou-Dennis & Grydehøj 2014). It is thus that different kinds of island cities have developed at different times in Europe, Asia, Africa, and the Americas. It seems inescapable to study islands and cities in tandem. The Island Cities and Urban Archipelagos research network and conference series as well as the open access journal Urban Island Studies have been established to explore the interaction between island and urban processes (Grydehøj et al. 2015). Following a successful conference in Copenhagen in 2014, University of Hong Kong will be hosting a new island cities conference in March 2016. There is thus reason to hope that the coming years will shed additional light on island city formation and development. Adam Grydehøj is a researcher based at the Department of Human Geography, Lund university. He is also Director of Island Dynamics (www.islanddynamics.org) and Chair of the Island Cities and Urban Archipelagos Research Network. Grydehøj, A. (2015) Island City Formation and Urban Island Studies. Area. doi: 10.1111/area.12207. Grydehøj, A., Pinya, X.B., Cooke, G., Doratlı, N., Elewa, A., Kelman, I., Pugh, J., Schick, L., & Swaminathan, R. (2015) Returning from the Horizon: Introducing Urban Island Studies, Urban Island Studies, 1(1), 1-19. Jeffries, S. (2015) How to build a city from scratch: the handy step-by-step DIY guide, The Guardian, 30 June. Pigou-Dennis, E., & Grydehøj, A. (2014) Accidental and Ideal Island Cities: Islanding Processes and Urban Design in Belize City and the Urban Archipelagos of Europe, Island Studies Journal, 9(2), 259-276. This entry was posted in Area, Content Alert and tagged city formation, Island cities, spatiality, urban island studies, urban studies, urbanisation on July 10, 2015 by RGS-IBG Managing Editor: Academic Publications.